Scotland put two years of misery behind them as they finally ended their nine-match RBS 6 Nations losing streak with a 36-20 win over Italy in Rome. Not since their last visit to the Eternal City in 2014 had the Scots tasted the sweet joy of victory in the championship. But that long wait was finally ended as tries from John Barclay, John Hardie and Tommy Seymour -- as well as 21 points from skipper Greig Laidlaw -- kept the determined Azzurri at bay. Italy scored either side of the half-time break through Leonardo Ghiraldini and Marco Fuser and when the Scots lost both Finn Russell and WP Nel to the sin-bin in the closing stages it appeared they might be set for another heartbreaking tumble. But Vern Cotter's men hung on to get the victory that they will now hope can prove to be a springboard for further success in their final two matches of the tournament against France and Ireland. Having lost Sean Maitland on the eve of the Scots' last match in Wales, Cotter's plans suffered another late injury blow as David Denton was ruled out with a groin strain. Ryan Wilson was handed the Bath No.8's starting slot but the last-minute alteration was the last thing the head coach needed ahead of the must-win Stadio Olimpico clash. In the end, the change failed to disrupt the visitors. The two previous championship clashes between the sides had ended with the respective away team claiming last-minute victories but Scotland did most of their damage early. 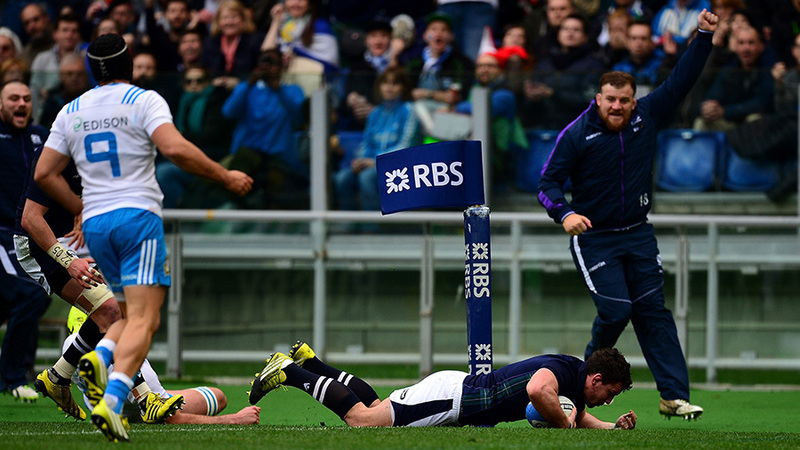 Kelly Haimona briefly gave Italy the lead with a penalty but the Scottish response was both immediate and emphatic. Tim Visser slipped the ball wide to full-back Stuart Hogg, whose dancing feet took him to within five yards of the Azzurri line before Haimona hauled him down. But the Glasgow man remained switched on, popping the ball off to Barclay as the flanker arrived like a steam train to dot down the opening score after 10 minutes, converted by Laidlaw. They had a second touchdown seven minutes later as Russell broke past three tackles to take Scotland to within scoring range again. From the ruck, the Scots moved the ball quickly out to Wilson and then to Hardie to dive over. Again Laidlaw added the extras. Scotland were finally showing the kind lethal touch they have claimed they were ready to unleash since their encouraging Rugby World Cup display as they swarmed over the hosts. Laidlaw kicked another penalty but Italy were not ready to go down without a fight and they cut the deficit 30 minutes in when centre Conzalo Garcia and full-back David Odiete powered through some weak Scottish defence before releasing Ghiraldini to score, with Haimona converting. Laidlaw kicked the first of four second-half penalties five minutes after the restart but the Italians came again as they applied phase after phase of pressure on top of the Scottish line. 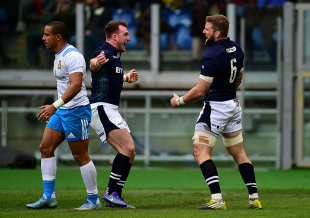 In the end, though they had to settle for another Haimona penalty as the Scots' scramble defence held out. With Laidlaw's boot keeping the Scottish scoreboard tally ticking, Italian skipper Sergio Parisse did his best to inject some impetus into his team's display with a daring 20-yard break but was left frustrated as his colleagues failed to follow up. They were boosted though when Russell was sin-binned after 62 minutes for illegally handling in a ruck and it took Italy just 30 seconds to make their numerical advantage count as Fuser squeezed the ball over the line from another forwards drive. Nel did his best to hold the flanker up but referee Jaco Peyper awarded the score after consulting upstairs and Haimona converted again. But again Laidlaw took wind out of Italian sails with another penalty, ignoring the home supporters' boos to fire over. Tempers flared more than once in the final 10 minutes as Italy scrapped for a way back into the contest. Russell returned but Scotland were soon a man down again as Nel was shown yellow for a deliberate knocked-on intercept. However, two years of pain was finally brought to an end as Scotland sealed the win they so badly craved two minutes from time. Duncan Taylor fed Hogg, whose delicious off-load to Seymour allowed his Glasgow colleague to scamper in from out wide in under the posts. That then left it to captain Laidlaw to put the finishing touch on a long-awaited victory with the conversion.